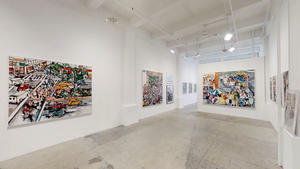 FIRST STREET GALLERY is a nonprofit contemporary art gallery located in the heart of Chelsea, steps from the High Line. We offer two exhibition spaces on the second floor of a prominent Gallery building. Our artists have been reviewed in the New York Times, The Wall Street Journal, Art in America, ARTnews, The New Republic, The New Criterion, Artcritical.com and The New York Sun. Through innovative programming that brings art and the community together, FIRST STREET GALLERY continues to nurture, educate, inspire and challenge artists everywhere. As an artist run gallery, we encourage members to pursue and determine the course of their own artistic careers. In 1969, FIRST STREET GALLERY opened its doors in Lower Manhattan when the art world was awash in second generation Abstract Expressionism, Pop Art and Minimalism. Founders Leonard Petrillo, Richard Pitts, Larry Montalto and A.D. Tinkham cared little for the seductive imperatives of this time. Instead, they created an artist-run gallery that heralded a return to figuration in painting, grossly under-represented at the time. It was a brave alternative supported in part by their college teachers. Luminaries such as Lennart Anderson, Leland Bell, Paul Georges, Gabriel Laderman, Alfred Russell, and Louisa Mattiasdottir participated in FIRST STREET GALLERY’s early invitational shows. Another member, Barry Lance, organized a contemporary landscape exhibition featuring Lois Dodd, Fairfield Porter and Stanley Lewis. Incorporated as a nonprofit in 1981, FIRST STREET GALLERY sealed its commitment to member as well as nonmember artists in recognizing their need for support at different stages of their careers. Towards this end, we have held annual National Juried Shows for nonmembers for more than 30 years, and in recent years have introduced an annual MFA Competition and a Pop Up show series. The Gallery continues a long tradition of Invitational Exhibitions and in looking towards the future, has added a new membership category for Affiliate Members.